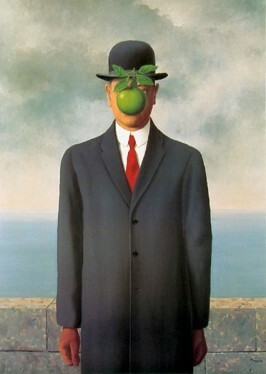 So I stumbled upon an image of this beautiful painting by a rather remarkable Belgian artist, that goes by the name “The Son of Man”. 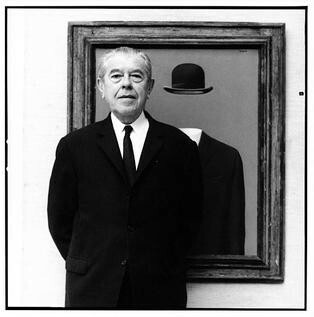 René Magritte is known in the artistic world for his witty portrayal of ideas through beautiful brush strokes. His paintings give an extraordinary meaning to ordinary things, which impel an individual to wonder and think beyond what he would normally perceive. The man in the coat is any ordinary man like us. We go to work, all suited up, only to be back to start the day in the same way again. He probably is a working man who earns a lot of money. But why is there an apple in front of his eye? Probably because, the apple represents survival. Among all the things that a man makes a living for, food comes first. A man is nothing without food on his plate, it is the first virtue. So, if you are trying to make him see the beautiful world around him, he can, in most cases, realize its beauty only after being able to have food to eat, good food for that matter, so that he shall be able to live through the next day or week or month. The wonderful river behind him, the construction, the clouds, the pavement, all comes next. Maybe this should make us realize that food is important for all. And hunger must not be a price to be paid for being poor. It is the basic human survival. Be it a man in a coat, or a beggar on the street, the apple shall always be in front of the eyes of both. Others might of course have varied interpretations of the same painting. Some might be more fulfilling and thought-provoking than this. When you look at a painting, or any design, you try to read the artist’s mind, although mostly end up perceiving something different around it. And that is what makes art so surreal and wondrous. The polymorphic nature that it caries with itself is aesthetic. Such exceptional eyes, and striking thought strings! I am falling in love with this artist. Painters like him make art worth appreciating, they retain its value over time. Art is such essential part of our lives and culture. Oh, I am so well-struck!